Karen Kim, Grammy Award winner, joins Jasper String Quartet | Dispeker Artists, Inc.
Philadelphia, PA — We are delighted to announce that Grammy Award-winning violinist Karen Kim will join the Jasper String Quartet in June 2018. Karen is a remarkable chamber musician who shares our passion for string quartets, new music, education and community. 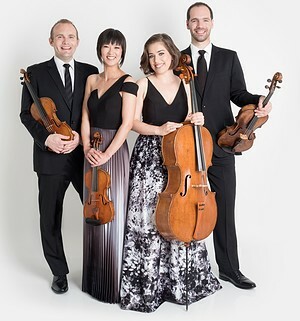 She has appeared as a guest musician with us frequently over the past season and we are excited to welcome as a new member of the quartet a musician with whom we have established a dynamic chemistry. Award and the Fischoff Educator Award, won numerous competitions, recorded 5 albums, commissioned and premiered many new works and worked with thousands of students. Looking forward, our commission of 4 Seasons from Lera Auerbach, Akira Nishimura, Chris Theofanidis and Joan Tower is on the 2019 horizon and our 3rd season as Founder and Artistic Director of Jasper Chamber Concerts continues in 2018-19. We'll also be performing around the country. We look forward to seeing you at a concert in the very near future and send all best wishes for a wonderful summer.